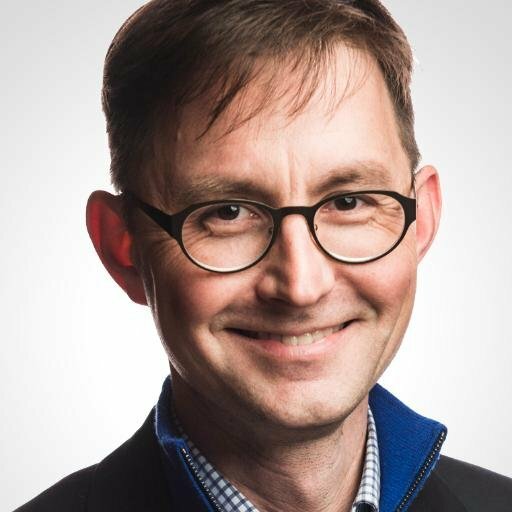 Orbit Media's Andy Crestodina knows the impact that good content can have on a business. Want to become a better content marketer? Start by following Andy Crestodina. Andy knows that deploying content that converts is a process. To do content well, you have to find new opportunities and measure your progress constantly. 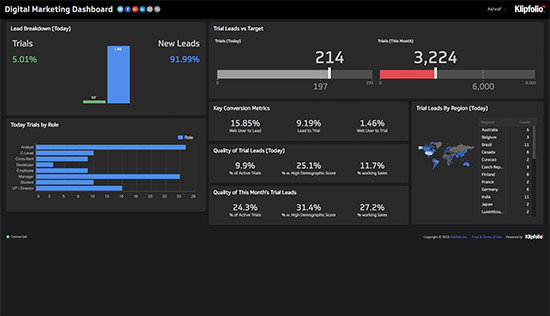 We teamed up with Andy to build a Content Effectiveness Dashboard that drives action. 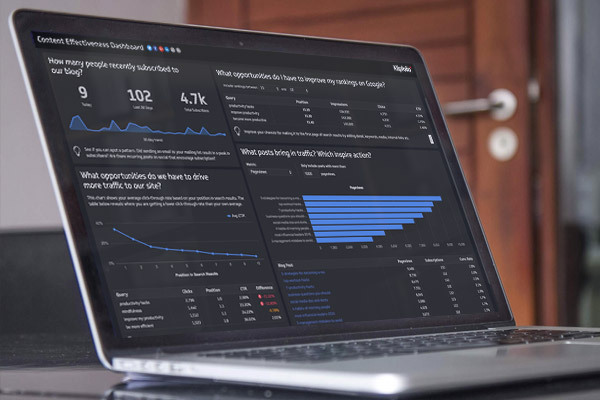 This dashboard features metrics based on his blogs and presentations, as well as tips he's absorbed from other industry experts like Larry Kim. Which posts bring in traffic? Which keywords should I focus on? Where can we improve CTR? Andy often digs into the key content metrics he thinks all marketers should track. Our mission was to automate this entire process. 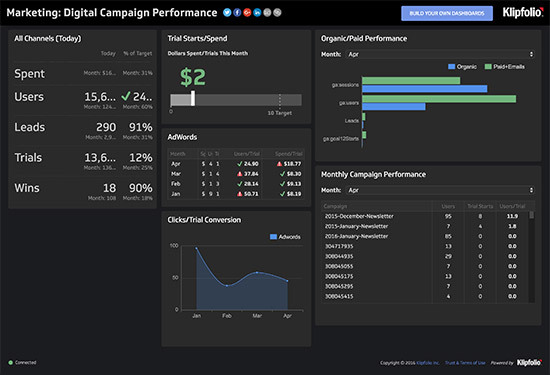 Using Klipfolio, you can get the Content Effectiveness Dashboard with a few simple clicks. 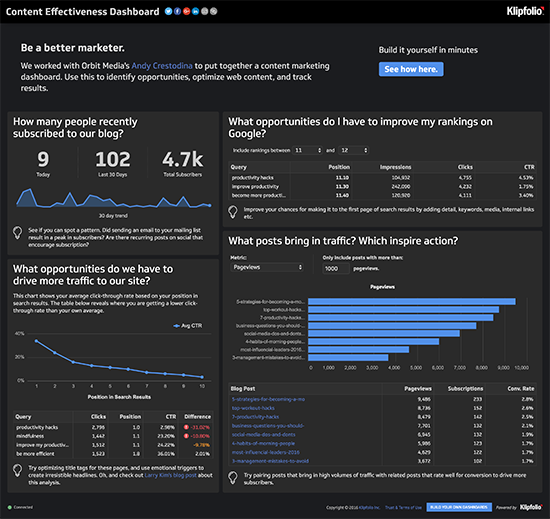 This page will give you all of the info you need to create your very own Content Effectiveness Dashboard and will also provide additional info on how you can share the dashboard outside of Klipfolio. 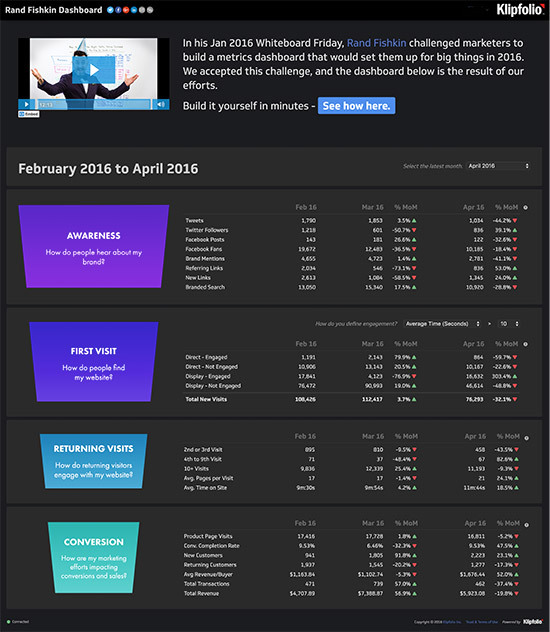 Klipfolio can automate the entire process of creating and updating this dashboard. To successfully set up the dashboard, follow these steps. Make sure you have valid credentials to the following services. What if I don't have credentials right now? No problem, you can always select the 'Connect Later' option. 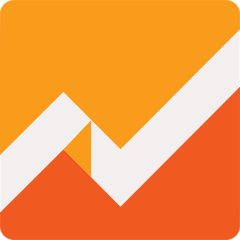 You can find the metrics listed in our Klip Gallery under the Content Effectiveness section or through Google Analytics and Google Search Console directly. 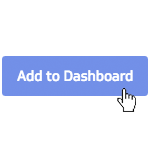 Build your Content Effectiveness Dashboard by selecting the "Add to dashboard" button in the Klip Gallery for each metric. You can even arrange the dashboard to look just like Andy's Content Effectiveness Dashboard by dragging and dropping the Klips into place. 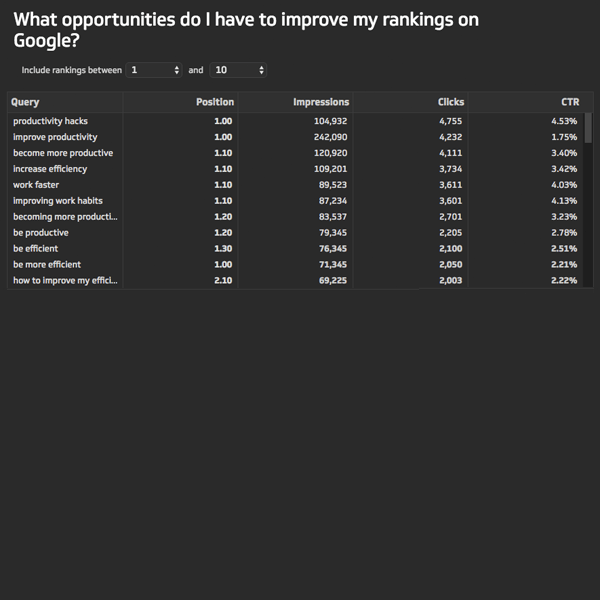 What opportunities do you have to rank on page one of Google? This metric measures your keyword rankings and helps you determine which words you have an opportunity to rank higher on. 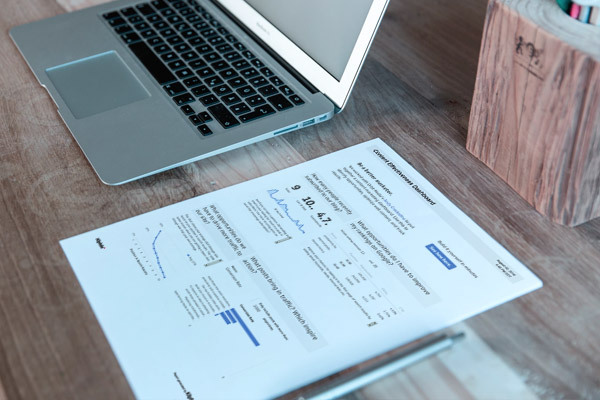 Notes: Use this metric to help look for easy content opportunities - such as where you rank on page two - and optimize that content to push it to the first page. 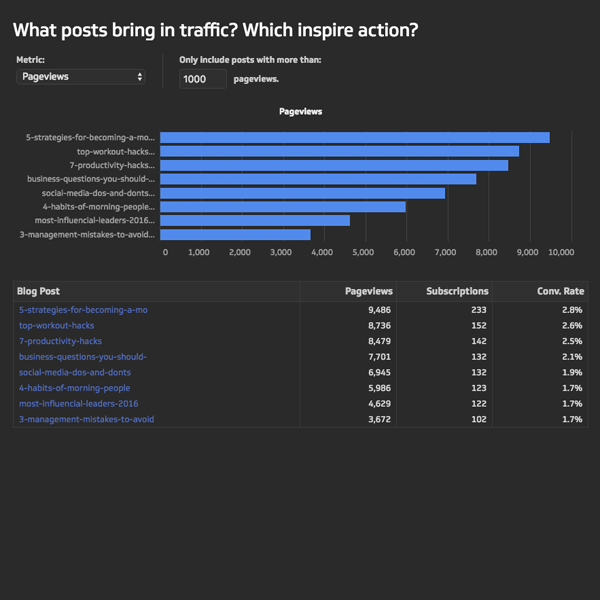 Which posts are bringing the most traffic to your site? And more importantly, which posts are inspiring action from your readers? This metric measures the performance of your blog posts by both traffic and conversions. Notes: Use this metric to determine which posts should be used to generate website visits and which posts should accompany those to help inspire desired actions like subscriptions. 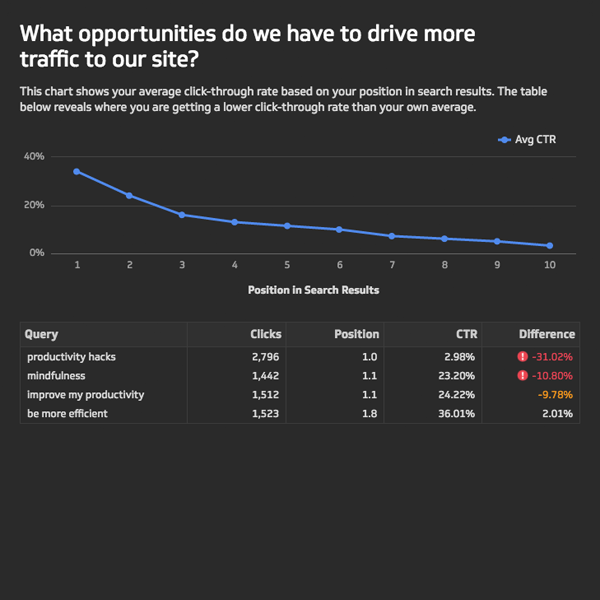 What opportunities do you have to improve your current click-through rates? This metric compares your click-through rates to the average click-through rate your content gets for that rank. 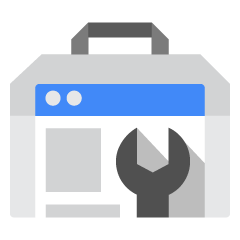 Notes: Use this metric to understand where you can improve CTR with stronger meta descriptions and titles. Tracking these key content marketing metrics is just the beginning. Get your team rallying around these results by sharing your dashboard. Here are a few simple ways you can share your data. 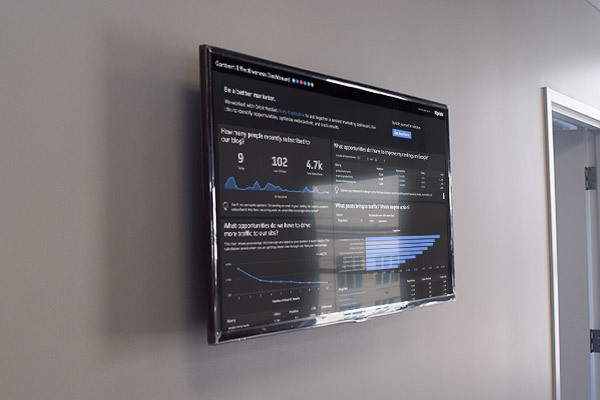 Nothing is cooler than a dashboard on a wallboard display. It captures attention, inspires conversations, and rallies your team around your key marketing metrics. The Content Effectiveness Dashboard is print-ready. Share it with your entire marketing team in just a few clicks. You can share a fully interactive version of the dashboard (just like we’ve done) using our published link feature. 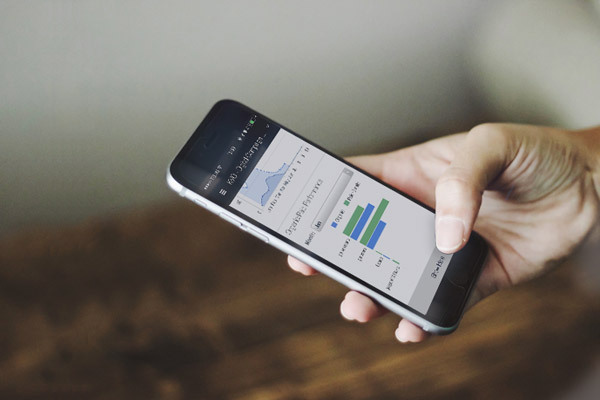 Keep the dashboard in your pocket using either our iPhone or Android app.